Who are PinoyInvestor's expert partner brokerage firms? PinoyInvestor partners only with credible and registered stock market professionals in the Philippines. We do not partner with anonymous entities on Facebook whom you do not know, cannot contact, or have no proven track record. PinoyInvestor’s current partners are several of the country’s top brokerage firms! They have a combined 100++ years (and counting!) of being in the Philippine stock market industry and have gone through all several boom and busts cycles. Unlike most other services providing stock market information, PinoyInvestor’s partners are registered with the Securities and Exchange Commission (SEC) and the Philippine Stock Exchange (PSE). Click here to know more about PinoyInvestor’s partner brokerage firms! How can PinoyInvestor make me a smarter investor/trader? PinoyInvestor’s mission is to help Filipinos become intelligent, independent, and responsible stock investors and traders. Ultimately, we desire for Filipinos to NOT blindly follow self-proclaimed “gurus” (especially anonymous types on Facebook) who may have their own hidden agenda when making recommendations. Filipinos should have their own Investment Objective and Strategy and realize that these could be vastly different from person to person, rendering free and standard advice on the internet inappropriate for them. Moreover, we do not want you boxed and dictated by other sources’ schemes (like dictated Buy Below Prices and forced Buy/Sell orders). We understand that to be truly intelligent and independent stock investors, you must possess the flexibility to decide on your desired profit percentage and entry/exit points. In the end, to be truly intelligent and independent stock investors, Filipinos should possess the capability to make their own smart investment decisions. How do we aim to achieve these? By providing Filipinos with the undisputed, most extensive source of credible stock market research and analyses prepared by the top stock market brokerage firms in the Philippines! PinoyInvestor will always have the widest reach of INTELLIGENT INFORMATION about the Philippine stock market because it partners not just with one, but several licensed stock brokerage firms with decades of experience and expertise. Equipped with useful information for BOTH long-term investors and short-term traders, YOU will always be in the best position to make smart investment decisions in the stock market! PinoyInvestor offers a Free Subscription Plan! This is helpful for those who want to try out PinoyInvestor first and get a peek of what it has to offer. Take note though that the information received by Free subscribers is greatly LIMITED compared to what our Premium subscribers receive every week. While Free subscribers only get 1-2 reports every week for free, Premium subscribers get as much as 40+ relevant reports weekly! Premium subscribers also get unlimited access to our Stock Rankings (80+ stocks in our coverage ranked according to Buy / Sell / Hold recommendations, Upside Potential, etc.) while Free subscribers do not get access to these coveted sections at all. Feel free to first try out PinoyInvestor for free! But to truly take advantage of PinoyInvestor, we invite you to upgrade to Premium Access! Our best-value Premium Access subscription translates to a cost of P399 per month — equivalent to just 2 or 3 cups of Starbucks coffee! Is there a simple guide I can use to understand PinoyInvestor's content? Yes! We created a Handbook on How to Use PinoyInvestor for you to be able to use PinoyInvestor effectively! In this guide, you’ll see how to best use PinoyInvestor and which sections of PinoyInvestor are suited for your investment objective, regardless if you are into long-term investing and/or short-term trading! Make sure to read it so you’ll know how to truly maximize PinoyInvestor and to understand which sections are suitable to your investment needs. What is the PinoyInvestor Academy? 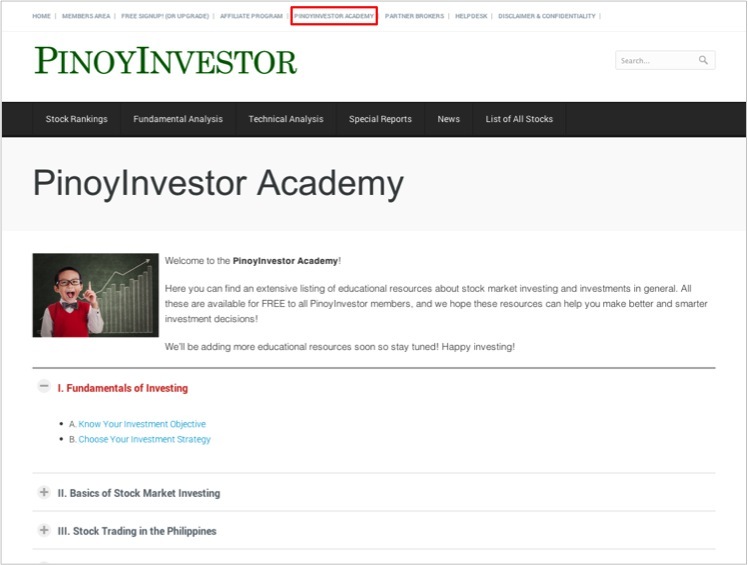 The PinoyInvestor Academy is our collection of helpful, educational resources that we exclusively provide to PinoyInvestor members. The good news is that, access is for FREE! This collection contains the basics of investing, stock market investing/trading in the Philippines, Fundamental Analysis, Technical Analysis, and more! Be sure to read it to become an even smarter stock investor and/or trader! Can I earn money with PinoyInvestor? Yup! PinoyInvestor has a rewarding affiliate marketing program that can earn you as much as PHP 1,300 INSTANTLY for every member you refer to a Premium subscription! Take a look at the earnings of one of our top affiliates who have been making tens of thousands of pesos of affiliate income every month! The details of PinoyInvestor’s affiliate marketing program is in our Affiliate Program handbook. It also contains the BEST PRACTICES implemented by our top referral marketers that help them earn tens of thousands every month! Moreover, we also provide you a tool to easily share PinoyInvestor reports with your embedded affiliate link! When you share this link (on Facebook, Twitter, or anywhere else) and a person signs up to a Premium subscription because of your link, we will reward you with up to PHP 1,300 cash every time! And with PinoyInvestor creating research, reports, and analyses every day, this is a tool that you can truly use every day. Be sure to use the PinoyInvestor Content Sharing Tool! Lastly, your personal affiliate link and affiliate banners and promotional links which you can use to earn money can be found in your Affiliate Program panel. How do I contact PinoyInvestor? Got any questions or suggestions? We’d love to hear from you! Contact PinoyInvestor via our online Helpdesk. We’ll be sure to get back to you in 1-2 business days.